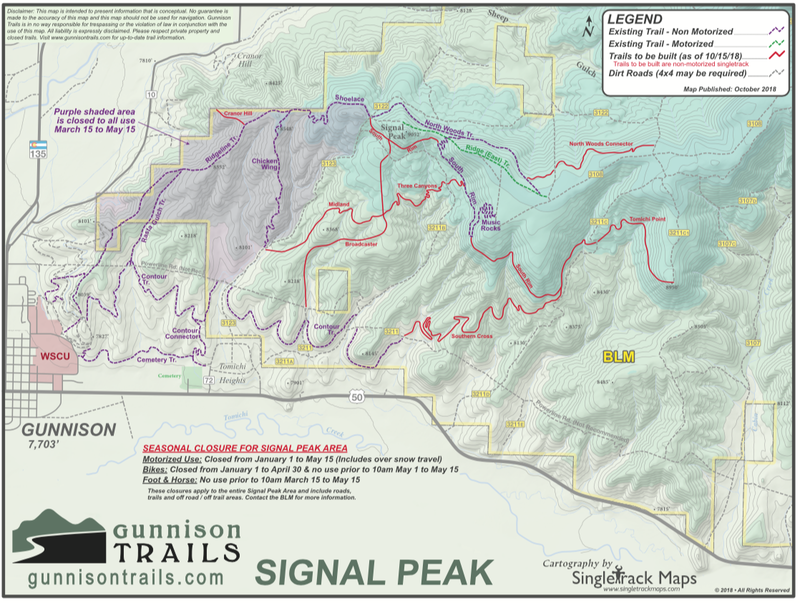 Since 2006, Gunnison Trails has advocated for a non-motorized trail system in Signal Peak, a 14,000 acre area managed by the BLM Gunnison Field Office. Sitting adjacent to the City of Gunnison and Western Colorado University, this area has historically been used by recreationists to quickly access the surrounding public lands. The Gunnison Sage-grouse Candidate Conservation Agreement (CCA), conservation measures adopted by Gunnison County, land management agencies and local governments in response to the possible listing of the Gunnison Sage-grouse in 2013, identified the area as an Urban Interface Recreation Area suitable for non-motorized trail development. In 2017, Gunnison Trails submitted a trail proposal to the BLM, and after an extensive NEPA process, received a final Record of Decision in June of 2018. The approved plan calls for 21.6 miles of non-motorized trail development, including adopting, maintaining or rerouting 7.7 miles of existing trails. Gunnison Trails hit the ground running in the summer of 2018, building three new miles of trail, including a portion of South Rim trail and Chicken Wing, which replaces Chicken Scratch trail. Gunnison Trails looks forward to developing the Signal Peak trail system and continuing the hard work that began in 2006. Stay tuned for more.